Everyone knows Miranda Priestly’s famous quote about how florals are hardly considered groundbreaking for spring. Normally, we make flower prints feel fresh for the new season with different interpretations of the pattern, such as retro florals, watercolor patterns and whimsical designs. Those who want something truly different can try butterfly prints. Butterflies are as quintessentially spring as flowers, yet the former isn’t viewed as a classic spring pattern like florals. (What gives?) Luckily, that means there’s a sense of freshness and novelty in trying butterfly prints. If we get beyond the floral chintz, we can see there are butterflies flying across a number of pieces, from dresses to accessories, so spotting a gorgeous print is easier than one might think. Some designers have already made butterflies a reoccurring theme in their work, from Alexander McQueen to the kitsch designs of Sophia Webster and her butterfly-topped shoes. And there are many more that embrace butterfly patterns in their spring lines. 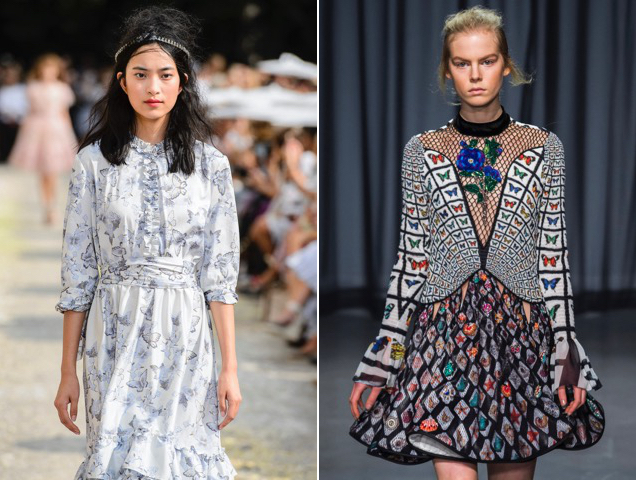 (See Luisa Beccaria’s and Mary Katrantzou’s Spring 2019 collections.) Designs can range from bold and abstract to soft and girly. Yes, some of them feature blooms, but the styles still stand out among more traditional offerings. We’ve done some of the work and collected a range of beautiful specimens, um, options. Get ready to fly away with these 17 butterfly prints for spring.